Impinj recently launched their new xArray, ceiling-mounted RFID reader system, intended to deliver "always on item intelligence." Here we consider the industry implications and why it is a meaningful step forward for the RFID industry. Impinj laid down an important milestone last week on the road to fully realizing the benefits of RFID. 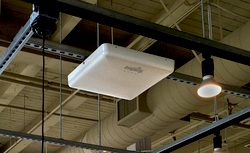 After a lengthy “Early-Access Program” involving over a dozen partners, Impinj launched their xArray, ceiling-mounted reader system, which is capable of steering a full-power, UHF RFID reader beam around a circle with a 7-meter radius. The xArray incorporates a Speedway Revolution reader, a multi-element, steerable antenna system and special software algorithms in a deployment-friendly, self-contained, overhead-mounted appliance. 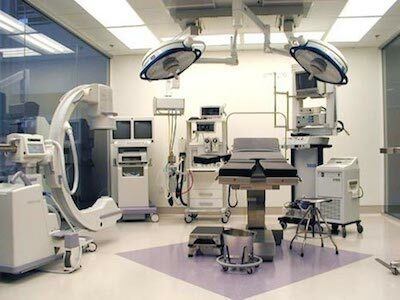 Applications include retail inventory management, tracking assets such as hospital equipment and tracking manufacturing work in progress (WIP). In retail, xArray stands on the shoulders of the increasingly common RFID handheld inventory management application (see The Evolution of Retail Store RFID Reader Strategies). Simplicity, low capital cost and large return on investment (ROI) are currently driving rapid adoption of the handheld solution. Compared to barcode-based inventory counting, handheld RFID offers substantially more accurate inventory accuracy leading to big jumps in revenue and gross margin from reduced out-of-stocks and markdowns. Labor savings can be substantial, although many retailers cite better customer service rather than cost reductions. Based on primary research with retailers and extensive financial analysis, we estimate typical payback periods for handheld solutions of 9-18 months, and an ROI that any CFO will love: highly-positive net-present-values (NPV) and three-digit internal-rates-of-return (IRR). But handheld solutions fall well short of the full potential of RFID. For one thing, handheld RFID depends on employee performance and compliance. One of the early learnings from field trials was that inventory accuracy was highly variable and dependent on how effectively the handheld was used, and as a result, staff training and compliance were critical. Garbage in, garbage out. While fixed infrastructure has the potential to deliver significantly more value than handhelds, it cannot compare with handhelds on a capital expense basis (see Comparing the Economics of Fixed vs. Handheld RFID Reader Options). 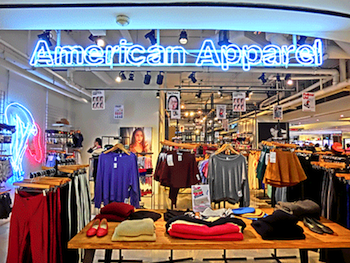 The hardware for the 8,000-square-foot American Apparel pilot store in Melrose, California, with its 15 readers, 150 antennas and myriad cables, carries an MSRP list price of over $45K, excluding a substantial installation cost. But xArray should significantly reduce the capital hit for fixed infrastructure. With its 1,500-square-foot coverage area and $3,300 MSRP, xArray could cut the capital outlay for overhead monitoring by more than half, and as a self-contained, power-over-Ethernet (POE) unit, deployment will be much less expensive. This comparison doesn’t address differences in how often tags are read, but for many apps, such as inventory management, it doesn’t matter as long as you read a tag a few times per day. xArray is just an appliance, and making good on this vision will require a complete solution. According to Impinj, their Early-Access Program partners have been working on software and solutions to take advantage of the xArray for about a year. Moreover, Impinj messaging seems to foreshadow a new, software-rich strategy to follow-through on the “Always On” vision. From what we’ve seen, the ongoing development of the software brains behind item-level intelligence will be one of the most significant strategic shifts in Impinj’s history. Look forward to hearing more about it from us in 2015.